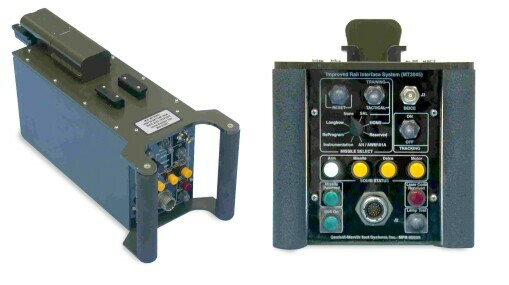 Advanced Hellfire Missile Simulator - MT3045 | Marvin Test Solutions, Inc. The MT3045 is an Advanced Hellfire Missile Simulator (HMS) for the Hellfire Modular Missile System. The MT3045 is capable of simulating Hellfire missiles, tracking critical signals, and displaying status to the operator. The MT3045 can further be used as part of a Hellfire test system and is fully programmable to generate all signals associated with all type of missiles, and perform measurements on signals generated by the M299 Longbow Launcher. In stand-alone mode, the MT3045 is connected to any of the M299 rails, and draws its operating power from the launcher. In this mode, the MT3045 simulates the selected missile (Hellfire, Hellfire II, P/R, or Longbow) and the operator can select the missile type (training or tactical) and launch mode: LOAL or LOBL (missile tracking or not). Additionally, the MT3045 can simulate other equipment such as AN/AWM-101, instrumentation, and reprogramming (to allow reload of LEA firmware). The MT3045 includes a laser code interface and supports both PRF and PIM (Alternate) codes. Seven indicators provide power, squibs, and laser code status. The sophisticated design of the MT3045 allows for advanced missile simulation and test using a serial link to the MT3046 IRIS controller or to the AN/TSM-205B Hellfire System Test Set. When “slaved” to the MT3046, the MT3045 allows full control and selection of missile types and modes, as well as a variety of other missile parameters (including the ability to simulate missile faults such as BIT failures, launch failures, and more). Additionally, the MT3045 provides the MT3046 with accurate measurements of all signals generated by the M299 launcher including momentary signals and stray voltage. Using state-of-the-art software, the MT3046 can communicate with one or two MT3045 simulators, providing for a simultaneous two-rail test and simulation of the M299 or M310 launchers. The HMS includes an extensive built-in test (BIT) that verifies the internal circuitry and provides status to the host computer. Additionally, the host computer can initiate a wide range of commanded BIT tests to verify the operational status of the MT3045. The rugged construction of the HMS provides for field operation anywhere in the world. The MT3045 can operate in adverse weather conditions providing the ultimate tool for field simulation and test. For those applications that require in-depth testing, simulation, and troubleshooting capabilities, the MT3045-BOP provides the ideal solution by combining the capabilities of the MT3045 with a Break Out Box. The MT3045-BOP provides direct access to rail signals and allows the user to either monitor these signals using external measurement devices, inject signals to simulate faults or special operating modes, and break signals between the MT3045 and the rail.